For OAF technical resource one of the most frequently asked interview question topic is MVC components. Controller is one such components. Lets read about the details of controller with interview perspective. Controller is responsible for handling users actions on the page. It also manages the flow between pages. Process Request: This method will handle HTTP get.For example while loading the page displaying the default items. Process Form Request: This method will handle HTTP post. For instance after loading the page if we want to perform any actions then we go for process form request. Process Form Data: This method is invoked upon a browser ‘post’. During this phase the framework will automatically apply changes back to the underlying view objects. It is not recommended to customize this method. If exceptions are thrown within this method the phase is skipped and the page re-displays with the error message. This parameter is used to get and set values of the fields using the OAPageContext.getparatmeter and OAPageContext.putparameter. To redirect the current page itself use OAPageContext.forwardImmediatelyToCurrentPage (or) OAPageContext.sendRedirect. OAWebBean represents the Hierarchy/Structure of the components in the page. WebBean represents the properties of item. 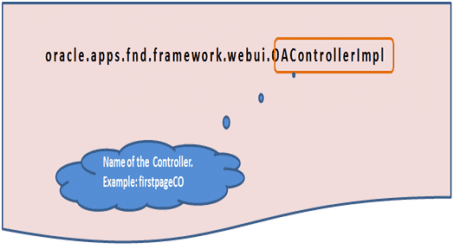 OAF MVC Architecture, OAF Controllers,Controllers in OAF,OAF Interview questions with Answers.